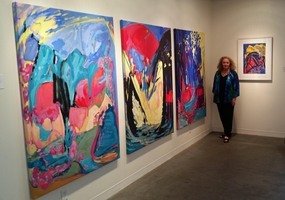 Mary Louise with "Luminous Voyage", a triptych, 66" x 144"
Mary Louise Long, a painter and printmaker, has exhibited her colorful large scale paintings and prints in galleries and museums in the United States. The artist's studio is presently located in Stamford, Connecticut. "Silent Stars - Indigo Shadows" is the most recent solo exhibition in Fairfield, Connecticut at Art/Place Gallery. exhibition "Order/Disorder", 2018, at Westchester Community College's Gallery, New York. "How High the Moon" at the Hastings City Hall Gallery, Hastings-on-Hudson, New York. This 2017 show commemorated the invention of the telescope. "A Painterly Progression" was the selected exhibition in October of 2016 by the artist at Art/Place Gallery in Fairfield, CT. Featured in this show was the triptych "Infinite Journey", with each canvas panel measuring 66"x48". The "Myth & Muse" exhibition at Art/Place Gallery in June 2015 featured her "Luminous Voyage", a triptych, 66" x 144". The title relates to the Odyssey. In a recent one person show at the Rockwell Galleries in Westport and Wilton, CT in 2014 she exhibited her paintings "Nebraska" and "Moons, Memories, Mysteries", a diptych measuring six by ten feet, as well as other paintings and monotypes. Ancient myths and legends contribute to the formation of the work, as well as literature and poetry. Her work for the exhibition "Generation: Filtered States" at Art/Place Gallery in 2013, focused on powerful light infused works that explored abstract relationships. The painting "Seamless Sands, Endless Waters", another diptych six by ten feet, was created from memories of her childhood in Nebraska. The artist states, "The human condition is of utmost importance. I search for that subjective shape that stirs the viewer to bouts of recognition and denial. The content of these works is the merge of the subjective and objective intellect." Long's paintings and prints have been exhibited in the Housatonic Museum, The Baltimore Museum of Art, the Jersey City Museum, the Trenton City Museum, the Slater Museum, in Norwich, CT, and the Fuller Museum in Brockton, MA. In 1992 the artist had a solo show of her monotypes at the Montclair Art Museum, Montclair, NJ. Additional one person shows include St. John's College, Annapolis, MD in 1975, The Studio Gallery, Washington, DC, in 1978 and 1980, The Alexey Von Schlippe Gallery of Art located at the University of Connecticut at Avery Point in 1999, 2002, 2003,2005, and 2008. Westminster Gallery at Bloomfield College also awarded the artist a solo show, as well as the Mayor's Gallery, Stamford, CT in 2001 and 2007. The artist studied Liberal Arts at Boston University, painting at American University, Washington, DC, and art history at William Paterson University, Paterson, NJ. She received a BA in Studio Art in 1983 and a MA in Printmaking, studying with Robert Kirschbaum, in 1985 from Montclair State University, Upper Montclair, NJ. As a Lecturer in Art at Bloomfield College, Bloomfield, NJ from 1986 to 1993, she taught courses in painting, drawing and art history, and also curated four exhibitions for their Westminster Gallery. From 1985 to 1993 she was a studio instructor at the Montclair Museum where she taught courses in painting and printmaking/monotypes. Ms. Long was a Visiting Artist at Trinity College, Hartford, CT in 1993 and 1995, lecturing on her paintings and prints, where she also taught a Printmaking course for one semester. As a member of the Arts Consortium in Southeastern Connecticut and Rhode Island, Long helped to organize exhibitions and a visiting artist lecture series. Her professional affiliations have included the College Art Association, The Center for Contemporary Printmaking in Norwalk, Connecticut, where she has participated in their yearly Monothon, Art/Place Gallery, Fairfield, CT, the Stonington Printmakers, the Loft Artists Association, the Monotype Guild of New England, the Women's Caucus for Art, the Katonah Museum, the Studio Gallery, Washington, DC, and the Phi Kappa Phi Honor Society. Among the awards Long received is a Painting Fellowship from the New Jersey State Council on the Arts for a series of paintings devoted to the Four Seasons. The artist's biography is listed in Who's Who of American Women and Who's Who in America, 2019. Mary Louise Long's work is represented in numerous private and public collections, including the George Washington University Library in Washington, DC, Henry Schein, Inc., Melville, NY, Haines, Lundberg and Wahler, Architects, NYC, Gerald D. Hines, Interests, NYC, Peckar and Abramson, Law Firm, River Edge, NJ, Vertrue, Norwalk, CT, The Watermark, Bridgeport, CT, Norwalk Community College, Norwalk, CT, and the Best Corporation, Sidney Lewis Collection, Richmond, VA.